SMAP, the pop group that has dominated the nation’s music scene for more than two decades, urged voters to support incumbent politicians as the ruling party faces likely defeat in Sunday’s Lower House election. The ad is an appeal to young voters to support the ruling Liberal Democratic Party, said Takao Sasaki, a professor of politics and media at Heisei International University in Saitama. “The ad clearly backs the LDP and Aso, and it could affect younger voters and SMAP fans who haven’t decided whom to support,” Sasaki said. 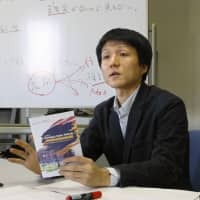 It may have confused readers because it didn’t cite any products or affiliation on the first page, Sasaki said, adding he initially thought the ad had been placed by the election management commission as a public service. Victor Entertainment Inc., which sells SMAP CDs and is a subsidiary of JVC Kenwood Holdings Inc., said it paid for the ad. An official at SMAP’s agent Johnny & Associates declined to answer questions on the phone. On the back side of the double-paged spread is an ad for a new CD called “Sotto Kyutto,” or “Softly, Tightly,” which went on sale Wednesday for ¥1,155. The ad wasn’t meant to support any specific candidate or political party, said Yoichi Miyagawa, a Victor official who manages the SMAP account. While the ad doesn’t mention any politicians by name, the message is clearly voicing support for Prime Minister Taro Aso and his party, said Susumu Kato, a managing director and chief economist at Calyon Securities. 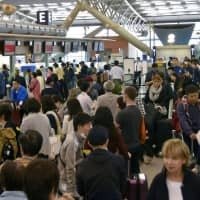 The LDP, which has governed Japan for all but 10 months since 1955, is facing a landslide loss in Sunday’s election, according to newspaper polls. 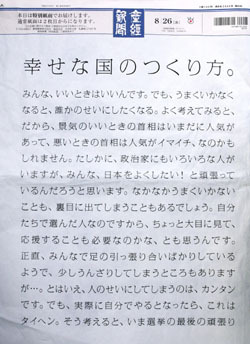 An LDP spokesman who declined to be identified said that while the party wasn’t involved in planning or creating the ad, it appreciated it as a show of support. 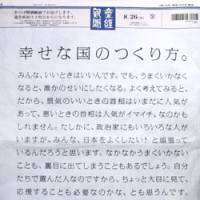 Sankei, a national newspaper that has a daily circulation of 1.8 million, said in a faxed statement the ad was appropriate and neutral. SMAP debuted in April 1988 and its members are between the ages of 32 and 37, according to the Johnny & Associates Web site. Members of the group appear on their own in TV dramas, variety shows and music programs each day of the week, and the group appears together in a variety program called “SMAP × SMAP” that airs every Monday at 10 p.m. 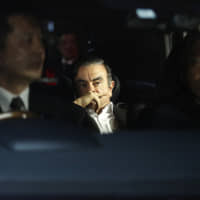 They also appear in commercials for companies that include Softbank Corp.
One member of the band, Tsuyoshi Kusanagi, 35, dominated media coverage for several days when he was arrested in April for indecent exposure in Hinokicho Park in Tokyo’s Akasaka district. He had appeared in a government-sponsored campaign promoting digital TV. The ads were suspended temporarily and have resumed airing. Tokyo prosecutors decided not to indict Kusanagi because he showed remorse, and the singer rejoined his group to tape “SMAP × SMAP” in late May.